Last week, Stripe, a web payments company, launched an online web security-based capture the flag event which ended today (Wednesday) at noon. The event was designed to challenge participants on some very common, as well as lesser-known vulnerabilities that exist in web applications. I decided to try my hand at some of the challenges and was fortunate enough to make it through all eight levels and earn myself an awesome prize (a Stripe T-Shirt)! I spent a bit of time after each level collecting notes about what I had tried, what worked, what didn't, and why the vulnerability existed. Some of the challenges really required out-of-box thinking, but capturing the password, and eventually the flag, was a truly rewarding experience. I have decided to make this blog post detailing each level now that the contest has ended. Stripe is releasing the CTF as a download for other organizers to run or to run locally, so if you haven't participated yet and may wish to in the future, I'd stop reading here because there are some very big spoilers ahead. I am going to break down each level into: a description and background explanation (so even if you didn't participate in the challenge, you can still get an understanding of what is happening), what the vulnerability was, and remediation methods. Note: All of my code solutions are also posted to my GitHub account. They are posted as-is and are not guaranteed to work without modification for your account/instances. The first level starts us off with a simple application. The Secret Safe is a form, written in JavaScirpt and the Mustache JS framework with a SQLite backend, that allows uses to enter a name, a secret name, and a secret, then save it in the database. The secrets can then be viewed by entering the name in a search field. We are told that the password to level one is stored in the database as one of the secrets. However, we don't know the namespace used to save the secret, and thus, cannot simply search for it. Trying out the application a few times allows us to see the functionality, which is relatively simple. Secrets can only be retrieved by entering the correct namespace in the box "view secrets for." Or can they? Luckily (for the attacker), the SQL statement used to retrieve the stored secrets is vulnerable to SQL injection. SQL injection allows us to enter arbitrary text that is interpreted as part of the actual SQL command. Here is the exact SQL statement that is used when the user searches for a secret. SELECT * FROM secrets WHERE key LIKE ? || ".%"
SELECT * FROM secrets WHERE key LIKE "test"
SELECT * FROM secrets WHERE key LIKE "%"
The fundamental problem with this web application (and the cause of most web application vulnerabilities) is that it fails to treat user-entered input as unsafe. Information that is provided by the user in any shape or form should never be trusted by the application without first checking the input. Each application has different methods of escaping data that is entered by the user before crafting a SQL query, so the appropriate method for the language being used should be implemented. However, even safer queries can be generated by considering the kinds of input. For example, an input asking for a user's name should never allow characters such as @, &, (, <, >, etc.). Level one implements a simple guessing game. 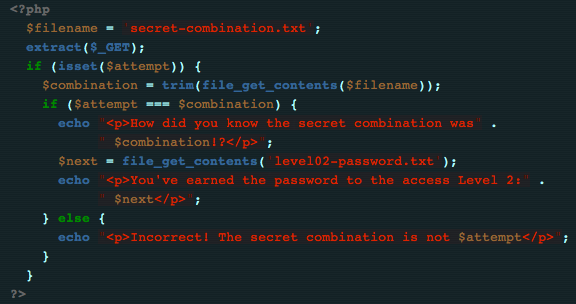 In order to determine the password to the next level, a secret combination must be provided. The level uses PHP to load a file on the server, read its contents, and compare it to the parameter provided via GET (passed in via a form). If the parameter matches the combination, then the password is released. to evaluate to true, releasing our password. Although the extract() function is dangerous in its native form, its security can be improved by using extract() with the EXTR_SKIP option. This option prevents already defined variables (such as $filename in the above example) from being overwritten by $_GET or $_POST variables. In addition, prefixes can be used to append a string to the variable if it overwrites an existing one using the EXTR_PREFIX_SAME option. The social network is a basic application that allows for images to be uploaded as a profile picture. There is little more functionality beyond that, but that is all that is needed to exploit this level. Note that we need to use ../ to go up to the user directory from the uploads directory where our page is saved. Running the page from the uploads directory gives us the password needed for level three. The main vulnerability here is that the upload page accepts files of any type. PHP allows upload restrcitions based on the MIME type (i.e. image/png, image/jpg, etc.). A file's extension should not be used as a sole valid check because anyone can change the extension of a file, although it can be compared to the MIME type for a bit of added security. Since MIME can be spoofed or arbitrary code can be inserted into an image file, the best option is to use a combination of MIME and extensions, check the MIME type on upload, and manually assign an extension based on the MIME type. Level three appears to be a simple login-based application. In order to determine the password, we need to login using a valid username and password. This application is written in Python (more specifically, the Flask framework) with a SQLite backend. To determine the value of the password_hash, we need to determine what function the application is using to calculate it. Looking at the code reveals that it is sha256. An online hash calculator allows us to determine a hash for a password we know, such as "pass" in the example above. As with level zero, user input should never be trusted. In this case, the first single quote after "bob" allows us to break out of the original statement. By properly escaping the input, this injection could be prevented. The concept of Karma Fountain is that users send other users "karma." However, to prevent abuse, the application also sends the password of the sending user to the recipient. A "super user" known as Karma Fountain has unlimited Karma to share. If Karma Fountain were to send Karma to someone, its password would also be exposed. The application prevents users from logging in as Karma Fountain. Finally, we are told that Karma Fountain logs into its account every few minutes. Now that we have determined that the password field is not escaped, we need to determine an attack type. Since the password field is shown to all users who have received Karma from us, we can launch a cross-site scripting attack against Karma Fountain by sending it karma from an account with a password containing XSS. To execute an XSS, we need to determine what is happening when we send karma. By using any intercepting proxy (such as BurpSuite or Zed Attack Proxy) or even using the web developer tools in the Firefox or Chrome browsers, we can see the exact request made to send karma. By setting this string as the password of my account, I could then login, send Karma Fountain some karma, and wait until it logged in, executed my script, and posted karma to my account, exposing its password. The above XSS payload could also be written in JQuery using $.post if the site is using JQuery. As with SQL injection, XSS is made possible by the direct use of user input as part of a page. In this case, the password field is the only input that is not checked. XSS is prevented by properly encoding the output from stored user input before it is executed as part of the page itself. Every language and framework has varying methods for preventing XSS (such as htmlentities and htmlspecialchars in PHP). You can read more about preventing XSS at this OWASP page. The Domain Authenticator is an application that allows users to provide a "pingback URL," a username, and a password to login. The pingback is essentially a website that validates the credentials and responds with AUTHENTICATED or DENIED. The response also includes the host, so for example, if "mysite.com/pingback.php" is provided, you will be authenticated as user@mysite.com. The goal is to authenticate as a level five user. However, the level five machines only have limited network connectivity to other stripe-ctf servers. Entering this URL in the URL field causes the response to recursively appear to come from a level five machine, allowing us to gain access. This vulnerability is introduced because of programming logic error. The developers did not consider that a user would recursively chain pingback URLs. It just goes to show that user input should always be treated as untrusted and to expect the unexpected. The security of this application can be enhanced by carefully deciding what input should be accepted. Streamer is a miniature Twitter-style application. Users post an update and all other users see it. There is one user, level07-password-holder, who checks in periodically (every three to four minutes) to see the latest updates. After creating an account, anyone can post updates which are seen by all other users. By visiting the url ajax/posts, a JSON string of all the previous posts can be viewed. When posting an update, a POST is made to that same URL with a post title, body, and CSRF token. The post body cannot contain quotes, or it is rejected. Finally, in order to remind users of their passwords, the application stores user credentials on a page called "user_info" which is available upon logging in. We are told that the level07-password-holder's password is complex and contains both single and double quotes, which is important. The vulnerability in Streamer is similar to the one in Karma Fountain (cross-site scripting). However, this level challenges the user to carefully craft an XSS attack that will obtain the required pieces of information and make the correct POST. Knowing that the level07-password-holder logs in every few minutes gives us an opportunity to create a payload. First, we have to find how the data is being retrieved and presented. Entering this code as the body of a post and then refreshing the page causes the alert to appear. We now have the format for our XSS. By looking at the source of the page, we can tell that JQuery is being used. This will make our attack much easier by giving us functions to work with and reducing the amount of code needed. It is also evident that a CSRF token is being used. Cross-Site Request Forgery is an attack that allows remote users to POST to a page from any other webpage, not just the page with the form. You can read more about CSRF here because our application is not vulnerable to CSRF thanks to the token. The token, however, is a necessary part of the POST request, so our XSS must obtain it before doing a POST. The methodology for this attack is to make a GET request to the user's user_info page (which contains his credentials), save the response, then POST the response to the ajax/posts page. Below is an XSS payload I used to do just that. Note that I used a replace function to remove the quotes before POSTing to prevent the password from escaping out of the JSON. Once the attack is crafted, we can post it as an update, wait for the level07-password-holder to log in, then visit ajax/posts where we should see the password. Again, this attack relies on the application to treat user data as untrusted. By properly escaping all data that users input, this attack can be avoided. WaffleCopter is a food delivery service that has a set of user "levels." The earlier users (determined by user_id) are "premium" users and can order premium waffles. You, however, are not, and can therefore not order premium waffles. The goal of the challenge is the order a premium waffle without being a premium user. Upon logging in, you are given an API endpoint, a user_id, and a secret. Using this information, you can POST to the endpoint using your secret and user_id to order a waffle. The application checks that you are a premium user before allowing a premium order. If you have a message that is concatenated with a secret and the resulting hash of the concatenated value (the MAC) – and you know only the length of that secret – you can add your own data to the message and calculate a value that will pass the MAC check without knowing the secret itself. Ultimately, because of the way SHA1 is designed, we can inject arbitrary data onto the end of a request following a padding, calculate a valid signature, and send this as the new request. Since we know the signature of user_id 1 from the API logs, as well as the length of the key, we can now calculate a new extended and padding message and a new signature that will pass the check. We have the key length (14). The original message is a request from the API such as: "count=2&lat=37.351&user_id=1&long=-119.827&waffle=chicken". We also have the original signature (in my case: bbab520cfdd9b8b91df1e613b0525d252b7c777b). The text we want to append is this: "&waffle=liege". This will override the first variable "waffle" and replace "chicken" with "liege," the name of a premium waffle. We can now make a POST request to our end point using our new message and the new signature. This vulnerability is introduced because of the use of an insecure cryptographic function, SHA1. Many better alternatives to SHA1 have been developed, including HMAC. It would also help if the API logs of users were only available to those users (this would prevent us from getting the needed signature). The last level of the CTF is rightfully the most challenging. It really requires thinking outside the box and it is quite difficult to spot the possible vulnerability at first. This level involves a password storing mechanism that saves passwords in chunks. For example, a 12 digit password will be stored in 4 chunks of three digits each. These chunks are then distributed throughout "chunk servers" which can be on different ports of the same physical server or distributed among remote servers. The main server receives a request for a password check, splits the password into chunks, then polls each chunk server for its piece. If the chunk is correct it returns true. This continues until either a chunk server returns false, in which case the password is returned as incorrect, or all chunk servers return true, in which case the main server returns true. When a POST is made, there is an option for "webhooks." A webhook will be sent a copy of the response, such as "success:true" or "success:false". One additional fact makes this level a bit more difficult: the level eight servers only have network access to other stripe-ctf servers. As with each of the levels, Stripe provided the source code for download. In the case of level eight, downloading and running the source code locally is extremely beneficial to understanding where the vulnerability may exist. Finding the vulnerability really requires thinking about all of the information that a server returns with its response, down to the socket level. Using the following code snippet, we can make a sample request to the server and print out the information associated with the response. Note that I have left out some import statements and other code for the sake of brevity. When this code is executed, a response is printed, including the data response, as well as the address of the server and the port number. This information is crucial to discovering the vulnerability. To find what is happening, we can make requests on our local server using a known correct and a known incorrect password. For example, if we start the server using password "123456789012", we can try requests with passwords "123456789012" (a correct one), "023456789012" (first chunk incorrect), "123056789012" (second chunk incorrect), etc. By analyzing the responses, hopefully a pattern will emerge. When the error is in the first chunk, the port numbers of two successive requests increments by two (the exact change number may be different for each application instance). When it is in the third chunk, the increment is by three, and so on. This pattern allows us to develop a script that can brute force the chunks individually rather than the entire password at once (the difference between a few thousand requests and 999 billion). Now, we need to run our script on a level two machine so that the webhook can be contacted (remember: level eight servers only have access to other stripe-ctf servers). Luckily, the level two server is running an SSH server as well, allowing us to connect. We just need to upload our public key to the ~/.ssh/authorized_keys file. To do this, I created a simple PHP page, uploaded it to level two, and ran it. The same result could be accomplished with a PHP shell, allowing us to enter commands directly. Now, we can SSH into the level two server. We can then cd to the uploads folder where we can run any scripts that are uploaded via the web interface (I never did get scp working). Back to the script, there are a number of ways it could be done. Personally, I wrote a script that checked each chunk individually, starting with the first. It would try "000", "001," "002," etc. On each request, it would analyze the port in the response. If it changed by the port increment (2 for the first chunk, 3 for the second, 4 for the third, and 5 for the fourth), it continued to the next request. However, if the change was more than the expected increment, it would pause and send two new requests with the same chunk (for example, "001" "001"). It would analyze the ports again. If the increment was not the expected increment, it would repeat the process two more times. If the ports incremented more than the expected increment more than three times in a row, the script stopped and marked the chunk as the correct one. The rechecks are done for error correction. Because many other users were testing on the same level eight server, two ports in the right increment did not always exist. However, it was rare that that would happen three or more times in a row. Once the chunk was found, I edited the script to test the next chunk. The overall process took about one hour. The script could be much improved by using multiple threads. I am uploading my scripts to GitHub, but they require edits before being usable on systems and user accounts different than mine. Eventually, after the third chunk was found, I switched to polling the main server for the full chunk: xxxxxxxxx000, xxxxxxxxx001, etc. When it returned true, I had found the flag! The vulnerability in this application is another programming logic error. The port that is returned in the request when a chunk is invalid should not be different from that of the main server. This again shows that attackers will use any information they can to exploit an application. 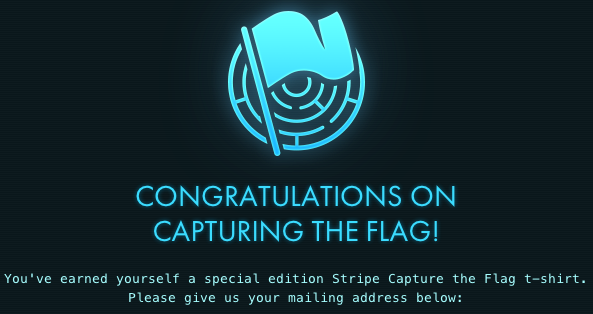 The Stripe CTF was a truly awesome experience. The challenges were crafted uniquely and with great precision. I admit that a number of these levels truly stumped me at first. But in a larger sense, they forced me to think in ways I hadn't previously thought. I hope this walkthrough has been beneficial and that this entire contest raises more awareness about web security as a whole. During the CTF I was Googling like crazy. Here are just a few of the resources I used while working on the CTF and in writing this post. Wow mate. Glad I follow You on twitter. I'm learning from the best. Thanks. Really detailed analysis. Thank you for sharing it! I couldn't win the T-Shirt, got stuck on level 8 :( Congratulations to you! Thank you very much for sharing this wonderful information with us.